A few residents of Swavesey will remember the "National" school but I doubt if anyone will recall either Charles Wood who took over the headship in 1914 or his highly regarded predecessor Henry Beaumont who died of natural causes in that same year. During the Great War the former served as a Sergeant with the 23rd Royal Fusiliers having joined up at Kitcheners behest on 14-Oct-1914. Charles finished his service in Feb-1919 having spent the final year demonstrating British Army field cooking methods to the cooks of Pershing's newly arrived American "doughboy" army. It would have been a source of pride to the late Mr. Beaumont's widow that by 1917 all five of her sons names appeared on the Roll of Honour which was pinned up outside Swavesey school gate. The roll was one of a number of devices used by the village elders to exert pressure on local men to enlist. The story of the Beaumont boys is typical of the experiences of a number of Swavesey families. 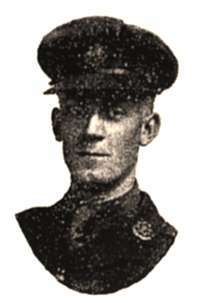 The first to enlist was Henry (Jr.) aged 25 - he was the 2nd oldest of the boys and joined the 7th (British Columbia) Battalion, Canadian Contingent on 3-Sep-1914. 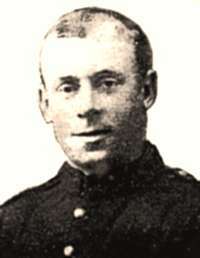 Henry had emigrated to Canada along with 3 Swavesey pals - Frank Day, Harry Wells and Lawson Hepher. The four enlisted en masse although Lawson was initially rejected on medical grounds. Following the British retreat from Mons the front line had stabilised and Henry Jr. found himself 5 miles North East of Ypres near St Julien. On April 22nd the Archduke Albrecht (commander of the 4th German Army) authorised the use of chlorine gas and the Allied front was ripped open as the 45th Algerian Div. and the 87th French Territorial Div. retreated in the face of "the green and yellow gas which turned into a blue-white mist as it drifted into allied positions". On the 24th gas was again used in the face of a Canadian counter attack and young Henry was killed during the fighting near "Kitcheners" wood. "A sniper opposite persistently shot at our periscope and once hit it without breaking the glass". "hold our trench at all costs while the English attack on our left and the French on the right..... interesting to watch the aeroplanes signal the effect of our artillery fire"
"preceded by an artillery barrage from 4am to 7am..... imagine a very heavy thunderstorm, with peals of thunder going on without cessation for hours... we have just heard of the sinking of the Lusitania..."
"The district around our trenches is a network of reserve and communication trenches numbered and named like so many streets"
"Last Wednesday we had a sports day for the division.... Sir Douglas Haig was there"
The sports day was a prelude to the British offensive at Loos after which Sir John French was replaced as C in C by Sir Douglas Haig. Ironically young Frank may have shared a similar experience to his older brother for Frank was injured near Grenay on 25th September at the time when British gas drifted back over our own lines in the prevailing winds. Frank was discharged from the army on 5th July after a period in hospital. Brother George (the 3rd oldest) was involved in no fewer than 3 major battles between the time he enlisted on 24-Nov-1915 and that of his death on 9-Feb-1918 two months before the Kaiser's offensive punched a hole 60 miles deep through the British lines. 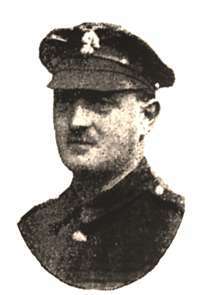 Prior to joining up George worked as a civil servant in the Admiralty - He enlisted with the 14th London Regiment (The London and Scottish) initially as a private and his baptism of fire came on 11-Jun-1916 when he was injured at Gommecourt on the Somme shortly before the big offensive. "The position occupied by ...was subjected to a heavy bombardment and machine gun fire.... In the absence of his Company Commander.... coolness and splendid example.... later he returned to the assistance of one of his men who had been wounded... bandaging him and carrying him through the barrage"
Some six months later George gave his life for his King and Country. Letter to Mrs. Beaumont from Battalion Commander 3-May-1918: "He was not only a splendid officer who knew his work well but also had the hearts of his men... he died a brave soldier (at the age of 29) fighting to the end". The oldest brother was Percy - a mild mannered Cambridge Graduate who was the "classics" master at Wyggeston school in Leicester. He probably registered for service under the Derby scheme joining the Royal Garrison Artillery in early May 1917. He went to France on 20-May but was discharged from the army, shell shocked and traumatised on 1-Nov-1917. 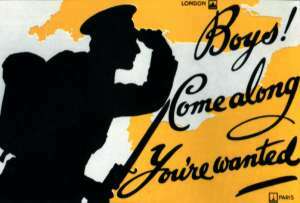 "A message written for her on the back of a packet of German cigarettes... stating that he was a prisoner safe and sound... an Officer attached to the British Mission at French General Headquarters explained that it had been taken from a captured German airman who had intended to drop it over German lines." Young Arthur must have been very persuasive. "During last week I have had two fine bathes in the river on the banks of which is the house where we live... reminds me of the old times when we trudged down to the sheep-wash at Swavesey for a swim". Mrs. Beaumont must have been so relieved to hear that her youngest son was safe and well. The war had been cruel to her as it had been to other Swavesey families - Two Beaumont boys dead, two cruelly injured and only one unscathed and safe.